Prospective Senior Enlisted Leaders of the Navy’s Information Warfare Community visited the Park on April 15th as part of their recent leadership training conducted at NAS Pensacola. This command works in information, intelligence, counterintelligence, human-derived information, networks, space, and oceanographic disciplines to support US Navy, Joint and national war fighting requirements. These presentations emphasized and provided examples of the leadership qualities and skills needed and valued in our military leaders throughout our history. It was a very moving and meaningful experience and the Veterans Memorial Park Pensacola provided the perfect setting. 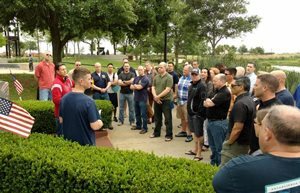 The group consisted of 45 members, E-7 through E-9, led by ISCM(IDW/SS) Mark S. Kochanowicz, USNR, that used the Memorials at Veterans Memorial Park as the setting for their discussion of Navy Heritage. As they visited each memorial in the Park a 2 members provided a presentation about a senior enlisted member that was killed in action during the conflict memorialized.